A new Ontario wine venture was born in Niagara in February. WineSplash.ca, an on-line shopping mall for VQA wines, launched with the goal of providing wine consumers with a web-based source for purchasing Ontario wines. Of the thousands of wines produced in Ontario by over a 100 wineries, only about one third of these wines are available at the LCBO. WineSplash.ca was started by two Niagara born and raised friends and small business owners from St. Catharines, Mike Girotti and Mike Shepard, and offers a wide selection of Niagara wines from a dozen or more (and growing) wineries which can be purchased on the site and delivered to your home. Consumers can shop on-line or choose from one of the wineSplash wine clubs, which offers a choice of 2, 4 and 6 bottle packages that have been carefully chosen from the various wines available in the on-line retail store. Legends Shiraz Reserve 2007 ($20, Winery, or WineSplash.ca, 90 points) — Classic Rhone-style nose of roasted game meat, dark fruits, leather, peppercorns, earth, tar, anise, currants and bold oak stylings. This is a big, in-your-face red with powerful black and bramble fruits, layers of milled pepper and spice and tannins that have smoothed out and integrated. It’s nicely aged and will reward with another five years in the cellar. Fans of bold flavoured Syrahs (Shiraz) will appreciate the style. There’s a decent release of Niagara wines this Saturday at Vintages. Here are two that caught my eye. Ridgepoint Reserve Pinot Noir 2009 ($30, Vintages Saturday, 91 points) — A sturdy and tight version of Pinot that will reward with time in the cellar. The nose reveals rosehip, sour cherry, bramble and wonderful spice nuances. I love the earthy notes on the palate with warm, stewed cherries, vanilla, mocha and depth of flavours through the finish. Very smooth and textured Pinot. For cellaring at least a couple of years. Coyote’s Run Red Paw Vineyard Pinot Gris 2010 ($18, Vintages Saturday, 90 points) — From single vineyard fruit picked on Sept. 3, this Alsatian styled Gris, is finished at 14% alcohol but doesn’t show it. A tropical fruit salad on the nose with melon, spice and light perfume notes. It’s finished dry but has a sweet impression from the super-ripe fruit. Such great mouth feel and depth of flavour in this wonderful Gris from Niagara. 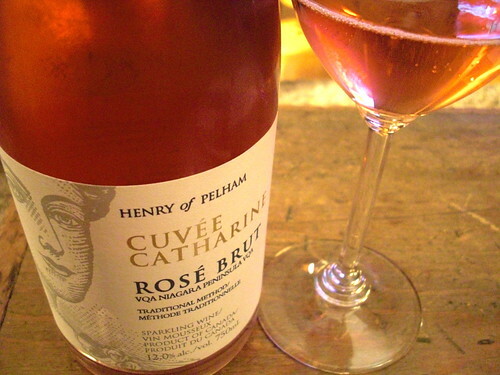 Henry of Pelham Cuvee Catharine Brut Rose NV ($30, winery, Vintages, 91 points) — Toast, strawberries, raspberries and brioche on the nose of this classy and consistent non-vintage bubbly made from Pinot Noir and Chardonnay in the Champagne method. It has bracing acidity on the palate to go with a vigorous mousse, red fruits, and toast. A refreshing and poised sparkler. Henry of Pelham Baco Noir 2010 ($14, winery, LCBO, 87 points) — Smoky black raspberry jam, currants, plums and spice on the nose of this wonderful and affordable red wine. It’s delicious on the palate with raspberry and currant fruits to go with tar, smoke and licorice all balanced by a core of juicy acidity. Coyote’s Run Cabernet Merlot 2010 ($17, winery, winesplash.ca, 88 points) — A blend of 46% Merlot, 41% Cabernet Sauvingon and the rest Cabernet Franc. It shows the ripe fruit of the wonderful 2010 vintage, with juicy blackberry, plums, cassis and touches of earth and spice. It’s friendly and smooth on the palate with lush, polished fruit and nicely balanced through the finish. Marynissen Sauvignon Blanc 2010 ($16, winery, winesplash.ca, 87 points) — A fruit-driven, barrel fermented, barrel-aged Sauvignon Blanc with tropical fruit and vanilla-inspired spices on the nose. Wonderful mouthfeel and fleshy fruits on the palate with just the right amount of spice.